In high throughput applications standard triangular or trapezoidal motion profiles have been widely utilized to reach a desired position quickly. As shown in Figure 1 the triangular velocity profile consists of a period of constant acceleration to a maximum velocity followed by a period of constant deceleration back to zero. With the standard triangular profile the acceleration increases or decreases almost instantaneously as shown in Figure 2 at time 0.0, 0.5 and 1.0. In these locations the rate of acceleration change (da/dt) is undefined and equal to infinity. The rate of acceleration change is given the name Jerk, j = da/dt and in high throughput applications the undefined jerk will cause impact loading, residual vibration and possibly audible noise. Introducing S Curves or 2nd order polynomials in the velocity profile as shown in Figure 1 allows the Jerk to be finite and the motion to be smooth. These S Curves are programmed in the motion controller and not limited to a specific drive technology. However, this article will focus on S Curves & linear motors sizing in particular because linear motors are used in the most demanding of point to point applications. The first step in sizing a linear motor with S Curves is to determine the motion profile parameters such as maximum velocity (vmax), maximum acceleration (amax) and RMS acceleration (aRMS) given the total move distance (st), total move time (tm) and duty cycle or dwell time (dw). For example, the application may call for a point to point motion of 1.0 meter in 1.0 second with an 80% duty cycle or dwell time of 0.25 seconds. To calculate the motion parameters we will first assume a triangular profile with full S Curve and then apply, if known, any maximum speed or acceleration constraints. The constraints in maximum velocity may be due to the linear bearings, linear encoder, limited controller data rates or the available supply voltage. The constraints in maximum acceleration may be due to the linear bearings, amplifier peak current or structural stiffness. If there is a speed constraint the motion parameters can be calculated using the 1/3 trapezoidal or general trapezoidal motion profiles with full S Curve which have lower speed but higher acceleration requirements than the triangular motion profile. With an acceleration constraint the total move time (tm) may have to be increased since the triangular motion profile already has the lowest acceleration requirements. In the above formula FRMS is the continuous force applied by the linear motor and Km is the motor constant which is a measure of the linear motor efficiency. If we let we get the form of the solution shown in Table 1 where the variable is the total payload. The constant forces (Fc) apply to the total move time (tm) and the dwell time (dw) only if the system is tilted at angle (θ) from the horizontal and the friction (Ffr) and external push/pull forces (Fe) are greater than zero. Assuming an air bearing stage with 10kg payload, zero constant forces, a preliminary coil mass of 0.5 kg and a 2.0m/sec peak velocity the RMS and peak forces are calculated to be 43.4N and 84.0N, respectively. Knowing these initial calculated forces a linear motor is selected that has a continuous force (FRMS) of 113N, peak force (Fpeak) of 400N and motor constant (Km) of 10.2N√W. Using formula 1.1 the continuous power dissipated (PRMS) is calculated to be 18.1 Watts which multiplied by the linear motor thermal resistance (Rth) provides the motor temperature rise (ΔT) due to the continuous applied force. The motor thermal resistance (Rth) is listed by the manufacturer as 0.87 °C/W and the motor temperature rise (ΔT) is calculated to be 15.7°C. The linear motor temperature rise (ΔT) should be less than the value specified by the manufacturer or the value required to achieve the desired machine accuracy. If we compare the values for the standard triangular motion profile the RMS force is 37.6N, peak force is 42N (0.5X) the continuous power dissipated is 13.6 Watts (-33%) and the motor temperature rise is 11.8°C (-3.9°C). 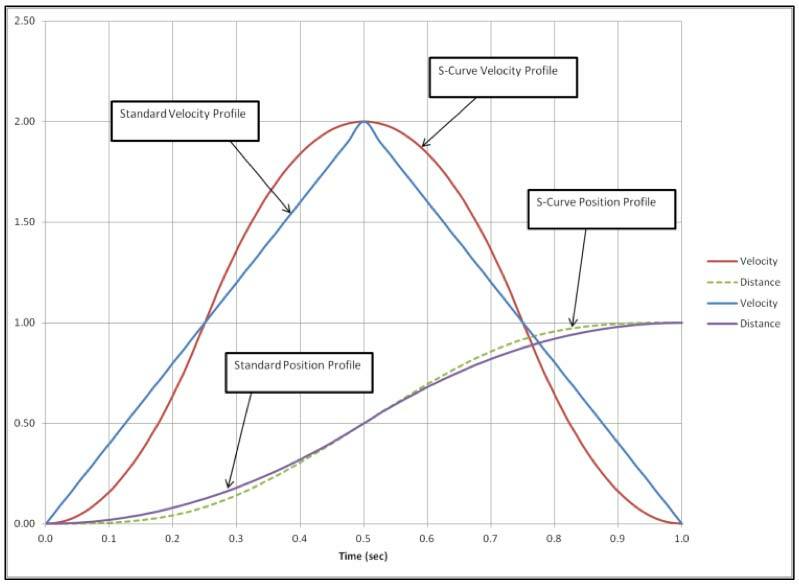 The S Curve motion profile is required for most high performance linear motor applications because it reduces impacts into the motion system and increases smoothness of point to point motion. 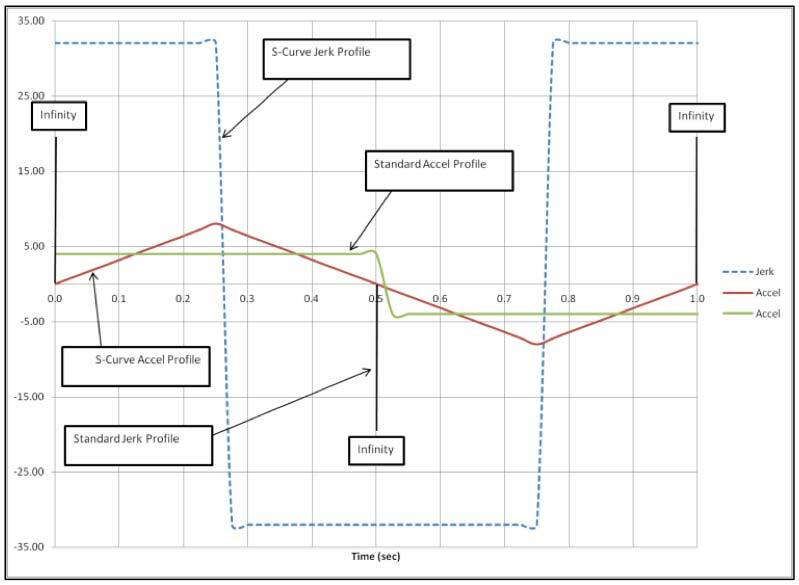 However, the designer must carefully consider the S Curve requirements during the design phase to avoid having to increase the total move time later in the build or testing phases. ETEL Linear Motor Handbook, Version A.